All Less is More products are highly concentrated, therefore Less is More in product use. Use a walnut size of product, spread between the palms of your hands and apply to lengths and tips, leave in for a little a while then rinse. May also be used as a hair mask. 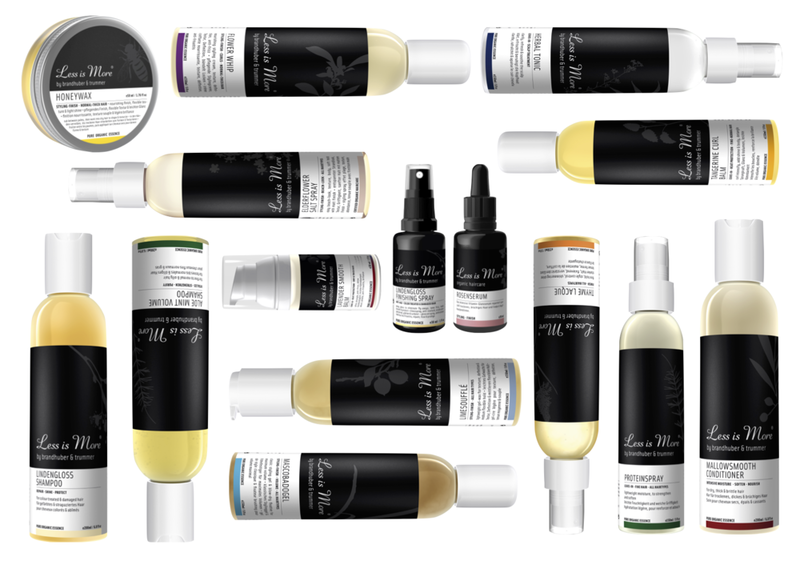 How to use LEAVE-IN & SPECIAL CARE, STYLING & FINISH products. Always start with only a large pea size of product, warm between palms of your hands and apply. For ROSE SERUM use only 2-3 drops. For HONEYWAX and KEISELWAX use a fingertip of product, warm between the palms of your hands and apply. LINDENGLOSS FINISHING SPRAY and ANGELROOT VOLUME SPRAY are both 2-phase products that require a good shake prior to use. ANGELROOT VOLUME SPRAY is heat activated LINDENGLOSS FINISHING SPRAY is not. Mist two pumps into the air and walk through. Work ANGELROOT VOLUME SPRAY through to your roots and blow wave upside down for volume. MORE VOLUME: Before blow-drying, spray ANGELROOT VOLUME SPRAY evenly into the root area of towel-dried hair. using a brush, lift the hair from the roots and blow-dry. Conventional hair products leave chemicals such as silicones in your hair and on scalp, often becoming occlusive to hair follicles. When you switch to organic Less is More haircare you may experience a 4-6 week detox effect which is a self healing process. HERBAL TONIC is recommended during the detox phase. It’s highly likely you won’t need to wash your hair so often with Less is More. Refresh your morning style instead with products such as PROTEIN SPRAY which combines beautifully with ELDERFLOWER SALT SPRAY, or any one, or a combination of STYLING & FINISH products. Brushing your hair with a quality brush daily, from root to tip, distributes natural oils, gently detoxes, vitalises and exfoliates the scalp and stimulates circulation of the hair follicles for healthy, shiny hair.